Georgia's Home Inspirations: Fall Flavor! Every year, at this time, I struggle. 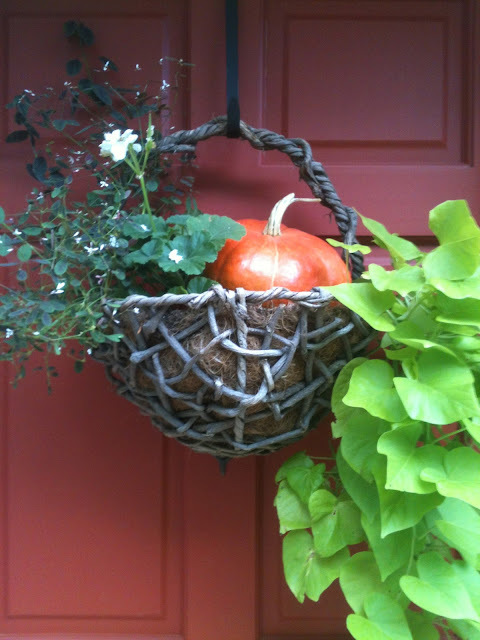 The planter at my front door is lush and thriving, but as Fall approaches, I'm eager to make changes. I'm seduced by ornamental kale, flowering cabbages, dusty miller, pepper plants and mums. But, I feel guilty; I can't bring myself to abandon the plants I've nurtured all summer. I mean look at my diamond frost and that sweet potato vine! Ripping them out right now is wrong isn't it? Darn these lingering warm temperatures! Don't get me wrong, I'm not ready for the cold, but what to do. How about adding a large bottle or crookneck gourd to the planter or nestling in a second planter filled with Fall plants. This year, I'm calling upon cinderella pumpkins to "season" my entryway and accessorizing with grapevine garland and burlap ribbon. I can carry this through to Thanksgiving with a quick bow change to celebrate Halloween. How do you make the transition? Georgia's wants to know!